Over seven decades after Independence, Kashmir remains an unfinished agenda for India as well as Pakistan. It appears that the Indian Government has run out of ideas to tackle this contentious issue. Over the past 30 years, the turmoil in Kashmir has spun a complex web that has engulfed local inhabitants and various agencies. Central and state governments have been pursuing party interests all along rather than earnestly addressing the matter. People of Kashmir have been gradually sucked into a vortex of dirty politics, greed, radicalisation and Jihad, besides the senseless call for Azadi, which no one comprehends among the local populace or can even explain clearly. Thousands of personnel of the security forces and the so-called local militants/mujahids have perished for no useful purpose. The security forces have only been able to control militancy to a limited extent, but failed to crush it altogether. The concept of ‘Iron fist in a velvet glove’ has come a cropper in Kashmir’s context. Tactical actions or concepts — SADO (Search and Destroy Operations) or CASO (intelligence-based Cordon and Search Operations) have proved to be marginally successful. Top institutes such as National Defence College and Army War College have been unable to suggest newer and effective concepts. The use of the so-called surgical strikes in the vicinity of the Line of Control (LoC) to derive political mileage has shamed the Army. Politicisation of the Balakot airstrike has demeaned the Indian Air Force. Opposition parties have crossed all limits by seeking evidence of such operations. All experiments by the two regional political parties — on their own or in alliance with national political parties — have all but failed to bring about peace or a worthwhile solution. Bilateral political agreements between Pakistan and India have been gathering dust, if not having outlived their utility. It thus emerges that there is no possible political solution to the Kashmir issue. In any case, the Pakistan army will not allow its polity to do so. It would be interesting to watch the outcome of the renewed alliance between the National Conference and the Congress for the 2019 polls. It could be yet another disaster due to the vested interests of both parties — to gain power and not address the Kashmir issue per se. Growing radicalisation is likely to be draped in the mantle of the Islamic State, which would then undermine any political initiative, which is already evident from the burning of school buildings and panchayat houses and the killing of sarpanches in the Valley. How can there be a political solution when the landscape is peppered with captured territories within the so-called Pakistan-occupied Kashmir (Gilgit, Baltistan, portions of Chhamb, Bhimber, Mendhar, Muzaffarabad, Aksai Chin etc.)? When all bilateral, political, diplomatic, economic and international interventions and even the ongoing low-intensity operations have proved to be unsuccessful over the past 70 years, then there remains only one way to resolve the issue. It’s the very method initiated by Pakistan. Military intervention is needed to recapture PoK and re-establish the state of J&K to its original status, conforming to the borders that existed before Partition. This intervention would automatically abrogate the Instrument of Accession along with the Special Status to the state and Article 35A (granted under the Constitution). 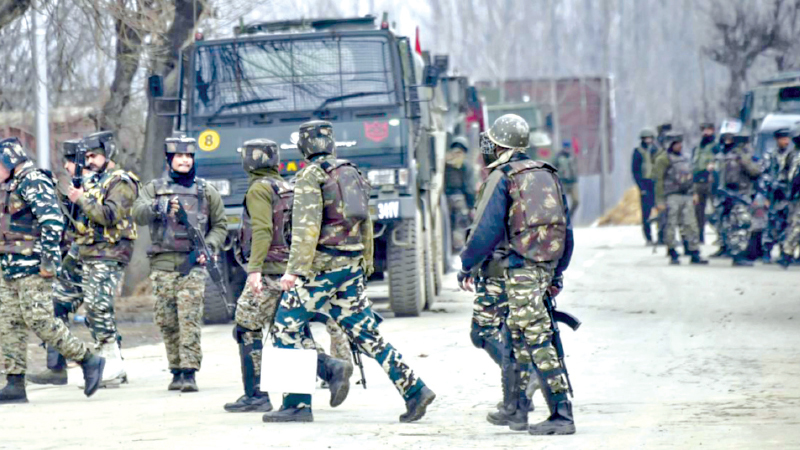 Pakistan and the ISI remain proactive, putting the security forces on the back foot, as was witnessed in the Pulwama incident on February 14. No lesson has been learnt from the massacre of about 75 CRPF personnel in an ambush by Maoists in Chhattisgarh in 2010. Acute failure of political initiatives over the past seven decades and the ineffectiveness of counter-insurgency operations in crushing militancy over the past 30 years clearly indicate that the Kashmir issue can only be solved by a full-fledged military intervention and not by dialogue/talks with a rogue neighbour. A swift military offensive into PoK with the aim of capturing lost areas emerges as the only option. What is lacking is a firm political and military will and a renewed national resolve beyond party lines to go in for this option.